You are browsing the Blog for youth media project. This piece from Youth Media Project is a touching collection of stories. Each one is short and simple, beautifully written, and accompanied by expertly curated music that matches each story's tone. I can picture each of these in my mind perfectly — the kind face of a grandmother, the coastline, little girls flitting about in their tutus, and a lone picture on a wall. The descriptions are not too lengthy, the stories are not too earnest, and the narration holds my attention with perfect footholds for thought in between. The answer to this question is yes — we've all been waiting for something — but maybe not for moments as profound as these. Of the many multi-voiced, almost vox pop styled pieces I've listened to on this site, this has to be one of my favorites. It's most notable for its global voices (from Tanzania, Canada, United States, and Uganda) that unite under one theme – waiting. Like a condensed "This American Life," it connects disparate tales in a way that immediately conjures memories and emotions. It lingers long after the first listen. Other producers can learn from many of the timing decisions made in this piece. Each of the four segments last just around a minute, the pauses between them aren't distractingly long, and the music fades are artful. When pieces like these rely almost entirely on copy, it's key that the recording of the narration is the best it can be so the listener can focus on the words, not the audio quality. This piece doesn't necessarily fit perfect into any one type of programming, but it stands very well on it's own. As teachers and students and producers, we can rarely predict where our work is headed. A small idea, a piece of great tape - we don't know how these will coalesce into a story, or how that story may reach a listener across the country. This month we've got lots of evidence of what's possible: from Youth Media Project with a remarkable tale of audio's reach, to awards that recognize success, to new audio that's destined for greatness. In the summer of 2011, seventh grader Gabriel Martinez joined Youth Media Project for Fathers in Focus, a program for youth experiencing homelessness. The piece he created, "Dear Father," is simple, beautiful, and devastating. Selected by PRX editors as both a Staff Favorite and a Best of Youth-Made Radio, "Dear Father" was also picked up by Remix, PRX's 24-hour stream. Listening to Remix from his cell in Boston, Sal A. heard "Dear Father," and was riveted. As an incarcerated man estranged from his own son, Gabriel's words spoke to him. He immediately wrote Youth Media Project a hand written, two-page letter thanking them for their work and urging them to continue. Sal went further, sharing what he would say to his own son. A good reminder: Young people's stories can transform both the teller and the listener. Read Sal's letter and hear the piece that inspired it. The appetite for quality youth-produced work is strong: The three top winners had 64 licenses among them. Most popular piece length: hours and pieces under ten minutes. Youth-produced stories were licensed 293 times in 2012. See if you placed! View the full Zeitfunk results. 2013 is off to a very good start. Listen! What Twilight Didn't Teach Me About Love, Philly Youth Radio. Jaya Montague brings a reporter's tenacity to her central question: How do you find love? Beautifully produced, the piece is willing to dig deep to find answers - and actually does. Bonus video, too! Good Loose Free, from OutLoud Radio's awesome intergenerational storytelling project. A profile of Jesse, who exuberantly connects sexuality, color, clothing and spirituality. 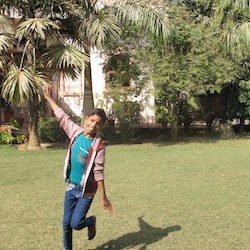 India's Shifting Gender Roles: One Girl's Tale from Rhitu Chatterjee, supported by PRX's Global Story Project. 12-year-old Sarita is playful, fearless and ambitious - she's also bound to her family and well aware of her duties as a daughter. Chatterjee explores the complex shift of India's gender roles in this engrossing and sound-rich portrait. Vox pops are a perfect teaching tool for Radio 101. But when you're ready to move to the next level? Consider the Sonic ID. Sonic IDs capture "little fragments of life as lived by our neighbors." Just 30-60 seconds long, Sonic IDs force the producer to develop an ear for good tape. What does that sound like? Transom Story Workshop recently produced a pile of great examples, plus some guidelines on how to make them. International childrens' radio network Radijojo invites submissions to its Global Green Kids environmental project. All "green" audio submissions welcome. Following up on their powerful piece, "Sexual Cyberbullying, the Modern Day Letter A," Radio Rookies will host an online discussion on sexual cyberbullying for teens on April 4th, 2013 at 1 p.m. EST. Signal is a bi-monthly publication of Generation PRX, a project of PRX.org dedicated to supporting youth-produced radio. We help youth radio groups share their work through the Public Radio Exchange (PRX), provide a space for training and feedback and bring stations to PRX to listen, license, and ultimately, broadcast. This month, I had the pleasure of listening to some great stories–some light and sweet, others heavy and grave. "Jimmy's Story" from Youth Media Project was one of the latter, making me cringe at the horrifying story of his bullying on his football team. Stories like these are important for society to hear, as they put the limelight on bullying as an issue that affects so many kids in so many places. This piece is an important message, giving hope to those struggling with bullying and showing everyone what is happening in schools across America. Ece Ergadöz produced the feature in the most recent episode of YouthCast. And though she produced it with the Youth Media Project in New Mexico, she has returned home to Turkey for the summer. She answered some questions via email ("Hi! I have my driver's test tomorrow, so sorry in advance for the short answers ") to let us know how her memory was jogged and her feature, Peculiar Privilege and the Elegy, was made. Why did it feel so awkward to ask that question about being an outsider toy your classmate? Why do you think people looked at you so strangely? It was strange because a very tolerant atmosphere towards all cultures exists at [United World College]. Therefore, asking my friend about the feeling of outsiderness was a little out of place I think. How did you get involved with the Youth Media Project? I got involved because I was very involved with the Constructive Engagement of Conflict program at our school. Naomi, the director, suggested that I join YMP. I came to love the project right away. Did you set out with a full idea of what you wanted to communicate through this story, or did it evolve more organically? I actually had no idea about what to do at the beginning, But after talking to my German friend Tina, who is featured in my piece, I decided upon this project. What was your writing process like? And then after that, what was your editing process like? The writing process did not take too long because once I got the idea, it was sort of like a stream of consciousness. Editing process was tough though, especially choosing short pieces out of the long interviews I made with my friends, and figuring out the technical aspect of editing. But I had lots of fun! Tell me a little more about growing up in Turkey. You talk about feeling out of place in your own family, but where do you feel like an insider? How would you define your culture? I grew up in Istanbul so I have been immersed in the modern day city culture of Turkey. I am really not familiar with my parentsâ€™ ethnical backgrounds and cultures to this day. Plus, my mother was also born in Istanbul and my father moved here when he was 1-year-old. So, I have been well immersed in the majorityâ€™s culture. Did you visit your father's hometown? I will be off to Harvard next fall. Thanks for featuring my story!